We are a day late in this since Quinnipiac keeps winning ECAC player and rookie of the week awards. That is a definitely a good thing and worthy of bumping this a day. Once again Quinnipiac dominated a weekend series as they swept the defending ECAC champion Princeton Tigers in a home-and-home series this past weekend by a collective score of 9-3. It led to Chase Priskie and Michael Lombardi being named ECAC player and rookie of the week respectively. With that said lets take a look at some of the future Bobcats who could win those awards down the road. 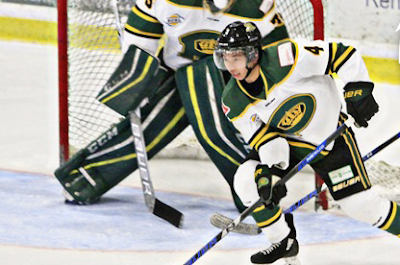 It was another good weekend for Jayden Lee as he picked up a goal and two more assists in two games for the Powell River Kings. On the season he now has 20 points (2 goals, 18 assists) in 28 games played and is riding a four game point streak. PJ Fletcher picked up a goal and an assist in three games played for the Wenatchee Wild. On the season, Fletcher has 13 points (4 goals, 9 assists) in 31 games played. Wyatt Head picked up a lone assist in two games last weekend. The prior week failed to mention that he had three assists. On the season, Head is the 5th leading scorer on West Kelowna with 23 points (3 goals, 20 assists) in 28 games played. Christophe Fillion had a three point weekend for the Wenatchee Wild in three games played. The Quebec native had two goals and an assist and now has 24 points (13 goals, 11 assists) in 31 games played. Fellow Quebec native Christophe Tellier had a goal and an assist in three games this weekend for the Wenatchee Wild. He now has 21 points (8 goals, 13 assists) in 27 games played. Logan Britt picked up a single assist in one game played over the past week. In 19 games played, Britt has 12 points (3 goals, 9 assists). You can read a Q&A with Britt here. Make that five straight wins for Justin Robbins. The New Jersey native gave up four goals in a 5-4 win over Central Illinois. He is 9-5-1-0 on the season with 3.46 goals against and an .876 save percentage in 16 games played. Evan Fear had a tough weekend as he gave up seven goals in a pair of losses for the Green Bay Gamblers. On the season he 6-6-2-0 with a 3.50 goals against average and a .900 save percentage with one shutout. Quinnipiac's newest commit is CJ McGee who is playing for the Shreveport Mudbugs. The Pearl River, NY native picked up a lone assist in two games this weekend. On the season he has 18 points (5 goals, 13 assists) in 24 games played. Expect a Q&A with at some point next week during the semester break. Connor Tait had a very strong weekend with five points on 3 goals and 2 assists for the Jersey Hitmen. He now has 13 points (7 goals, 6 assists) in 20 games played. 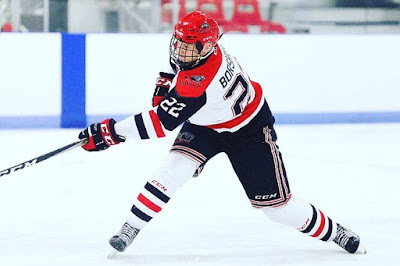 Arytom Borshyov has returned to the Northern Cyclones after a stint with Tri-City in the USHL. On Sunday he had a goal and three assists in a 6-5 win over the New Jersey Rockets. In five games played he has 4 points (1 goal , 3 assists). Yaniv Perets gave up three goals in a loss this weekend for the Junior Bruins against Syracuse. He made 29 saves in the game. In 19 games played he is 14-4-0-1 with a 2.15 goals against and a .937 save percentage. Nick Kent picked up a single assist in a lone game for the Buffalo Jr. Sabres. Kent now has 14 points (2 goals, 12 assists) in 25 games played this season. Jack Silich had a goal and four assists in three HPHL games this weekend for the Chicago Mission U-15 team. On the season he has 66 points (25 goals, 41 assists) in 46 games played. Oscar Plandowski picked a lone assist in one game for the Selects Academy at South Kent School U-15 team. In 31 games played, Plandowski has 39 points (7 goals, 32 assists). Liam McLinskey picked up one assist in one game this past week for the Don Bosco Prep hockey team. He has a goal and two assists in three games played this season. Jacob Quillan has gotten off to a strong start for the Salisbury Prep team. In three games played he has 6 points (2 goals, 4 assists).